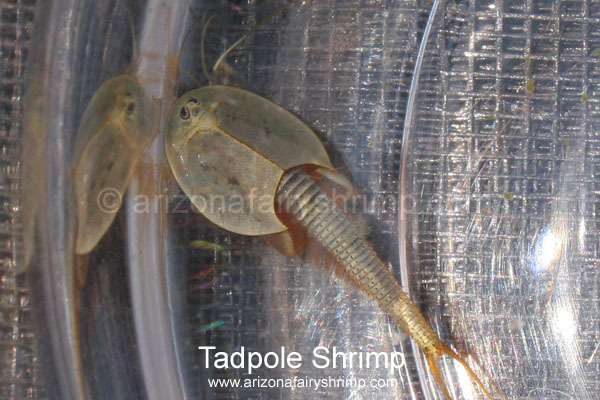 Tadpole shrimp is well known as Triops. Triops is Greek word, τρί(tri) meaning third and όψη(opsi) meaning look or sight, they have three eyes like their name. Two eyes can be found easily on the front of head, the third eye is placed at the middle of other two eyes, and it has lighter color than other eyes. Triops can't see through the eyes, but distinguish the brightness of light. They have a pair of long antenna at the front of legs, and use them to find food and detect nearby movements. 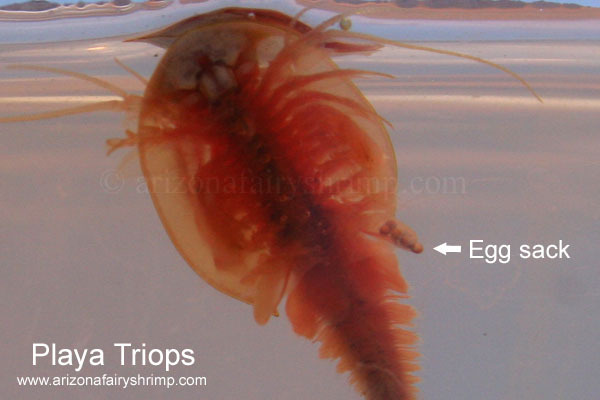 Triops's eggs are 270-400 micrometer in diameter, and hatch out in water temperature range 60°F to 95°F. 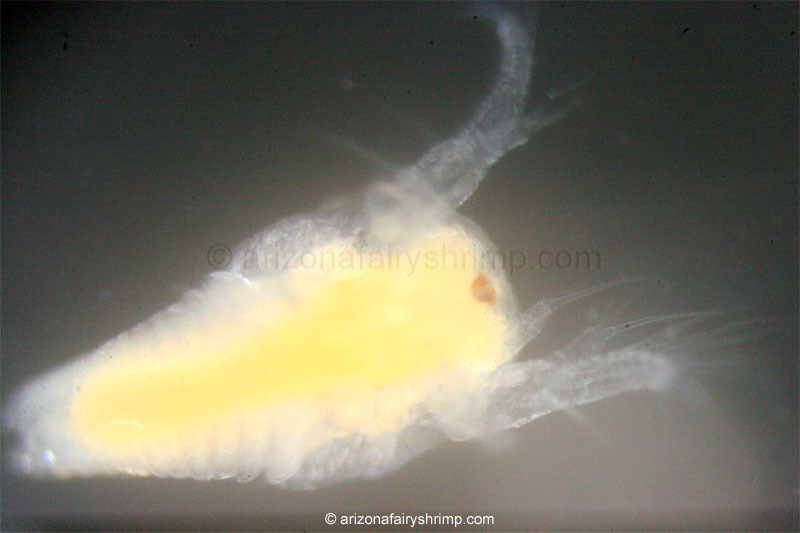 Hatched Triops is 0.8 mm long, orange color and look almost the same with fairy shrimp's larva. 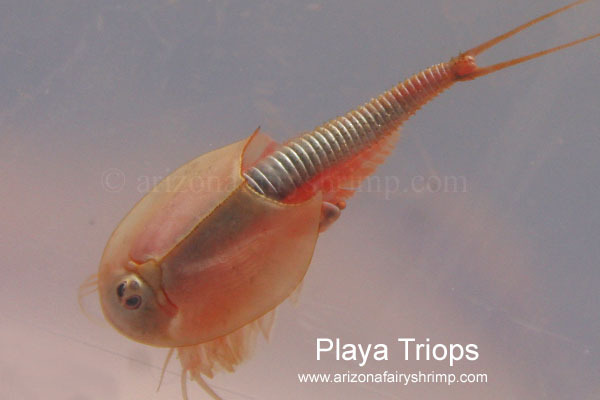 Baby Triops grows double every day in the best condition, and begin to develop the shell two days after hatching; also they are being ready to hunt fairy shrimp and water flea. 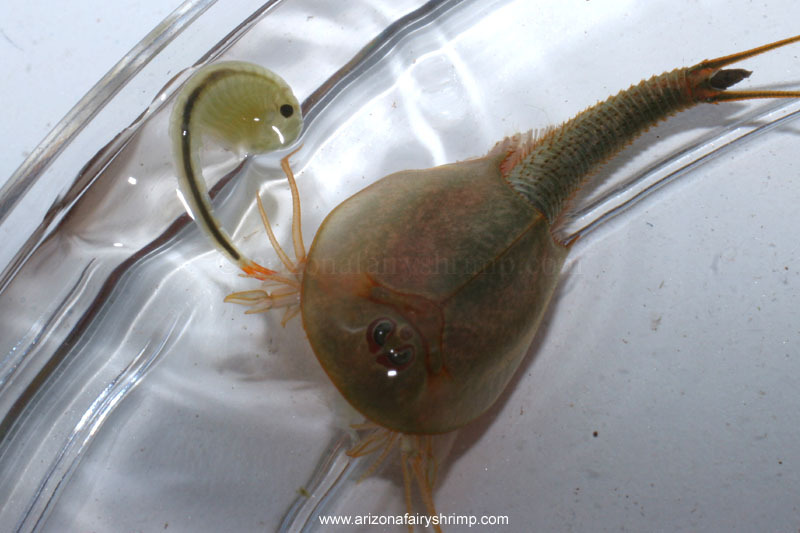 A female Triops starts reproducing 10 days after hatching, and leaves hundreds eggs in the lifetime. 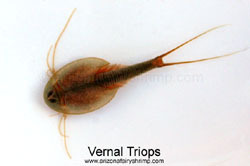 Triops usually live for 6-12 weeks, and grow up to 2 inches long (not including furcate tail). Triops have two egg sacks, and each egg sack holds 10-30 eggs, and the capacity depends on the size of Triops. Female Triops lay the eggs on the bottom of the pond and slightly cover them with mud. In the first week of reproducing, they produce eggs once or twice a day, then the rate becomes slower; this habit observed more obvious with the Triops living in the Dry Lakes (Playa). Egg sacks tailed at the end of shell. 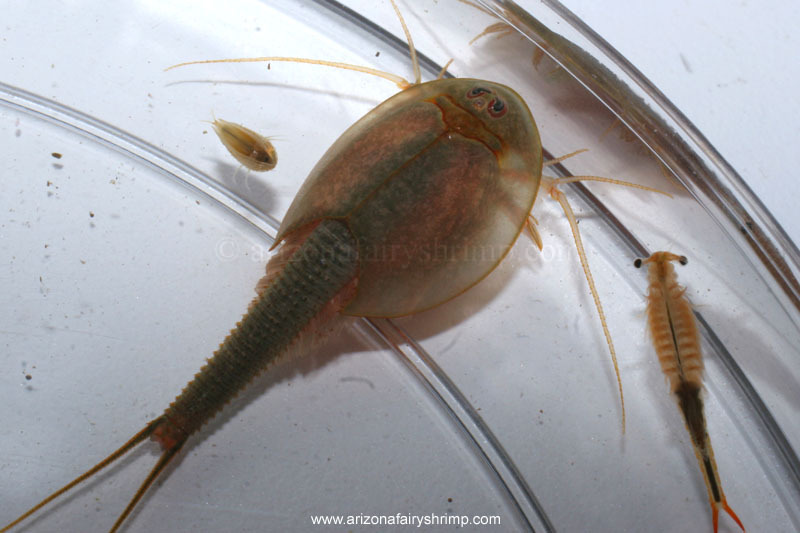 Triops begins hunting fairy shrimps 2 days after hatching, and eats up dozens a day. Sometimes a single Triops hunts over 500 fairy shrimps within a week. 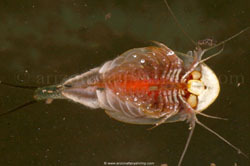 Also, they eat the dead body of Triops or hunt smaller Triops! So they are called as "Predator". 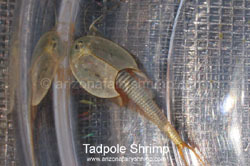 However, the name is showing a small part of Triops's character. 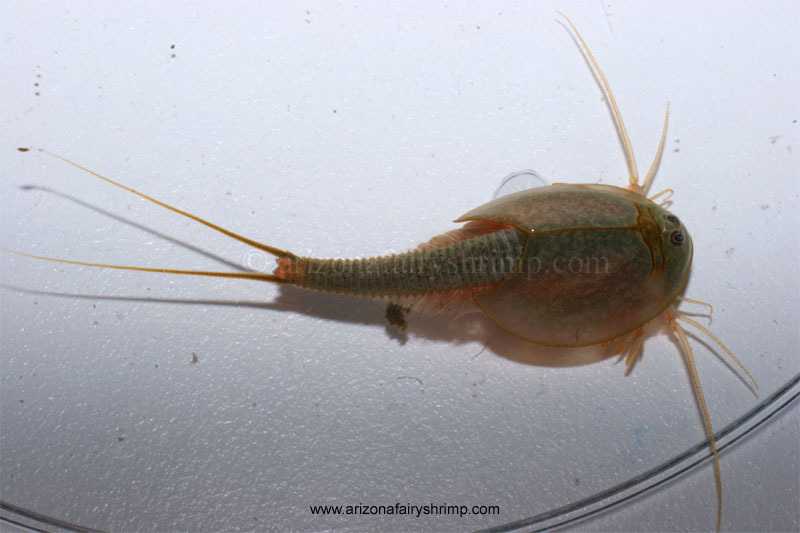 Triops only hunt other shrimps when they don't have enough food. When they have enough food like dead plant and algae, they stay under the bottom of pond and eat only the dead shrimps, and never touch the dead body of Triops. When they couldn't find enough supply from the bottom, come up to the surface and search for dead flying bugs.